In addition to creating a stack that supports a Rails App Server layer, you must also configure the layer's security groups so that the Rails server can communicate properly with Redis server. Create a new stack—named RedisStack for this example—and add a Rails App Server layer. You can use the default settings for both. For more information, see Create a New Stack and Creating an OpsWorks Layer . On the Layers page, for Rails App Server, click Security and then click Edit. 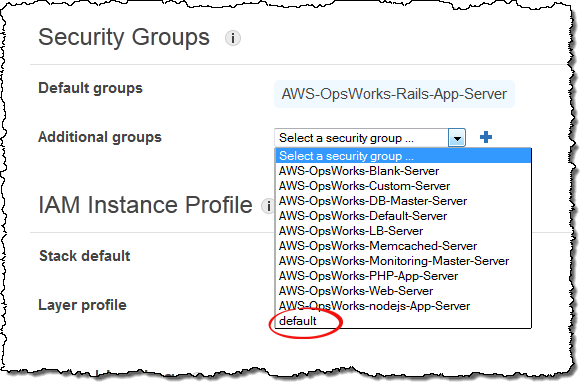 Go to the Security Groups section and add the ElastiCache cluster's security group to Additional groups. For this example, select the default security group, click + to add it to the layer, and click Save to save the new configuration. Add an instance to the Rails App Server layer and start it. For more information on how to add and start instances, see Adding an Instance to a Layer.